The idea of a 'father' in popular perception is stagnant as well as monolithic. He must go about working outside, with a briefcase in hand to prove his valiance and masculinity. But these stay-at-home dads are flouting this perception by being comfortable in their machismo. Prince George’s photo with dad William goes viral on Father’s Day, but where’s Princess Charlotte? The term ‘father’ known by disparate names in different languages, usually converges and points to a single individual in the crowd. There can and are many faces can but in essence he is one, or so is what the society would like us to believe. All fathers, as popular literature will tell you, are portrayed to be a certain way, much like their female counterparts. He comes in late from office, is immensely busy in his work to the point of not being able to give much time to his family, and later he must look fondly at his children and lament that he did not see them growing up. This may not always be the case in reality, but more often than not this is the popular and accepted narrative. It then would not be an exaggeration to affirm that ‘Father’, in popular perspective, is a monolithic concept – one that is rigid and has not undergone much of a change. With briefcase in hand and an occasional twirled moustache in place, he is believed to be the quintessential male figure, the proverbial man of the house, the guardian who protects his house. He may be lean or swarthy, short or tall but his machismo must be in place, and his ability to fend for the house, albeit by working long hours away from home, is often, curiously so, held as a yardstick to measure that. The mould is kept ready, and not fitting in it, completely and finely, is held against his machismo. 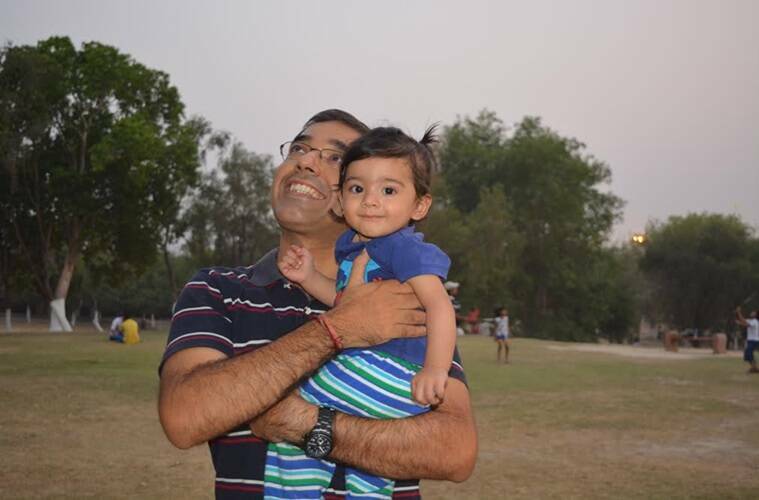 “I wanted to see her growing up,” Madhur Prabhakar, a 34-year-old resident of Faridabad says of his daughter Mysha, and offers this as the reason for his decision to stay at home and do just that – see his daughter grow up. Prabhakar is what in common terminology is referred to as a stay-at-home dad. The Oxford dictionary defines him and the likes of him as those who prefer to be at home rather than to travel, socialise or go out. It may sound surprising but Prabhakar is not the only father to have voiced such a wish and act upon it. In Gujarat, 32-year-old Sambit Mukherjee is doing the same. He stays back and looks after his daughter Shivangi, who just turned two, while his wife, a dermatologist practices at a government hospital. 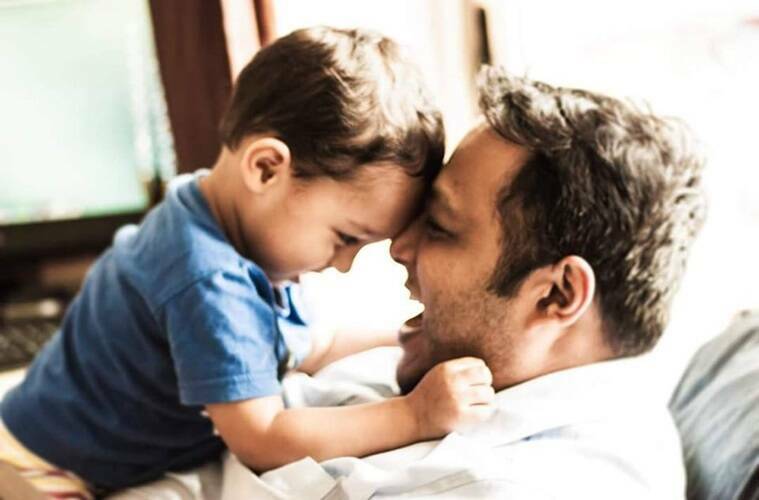 In Bangalore, Sid Balachandran, is a hands-on father who can hardly contain his pride while recollecting how he got it right the very first time he changed his son, Rishi’s nappies. The fact they that the three of them, and fathers like them, do not form the crux of the narrative we are only too accustomed to watching or reading about, needs no retelling. There is also a lurking risk of reading their stories in an alternate light and viewing them as examples of those who failed to make a mark in their respective professional fields. Those who consequently decided to take the ‘easier’ way out and stay at home. The fact, however, remains that the child belongs to both parents, and in their cases the fathers decided to invest themselves, more than what is considered a norm, and look after their offspring. And contrary to what is believed, they have not taken “the easy way out”. Prabhakar is a Practice Head at Ecoemmisions Xchange, whose first book is under publication, while Mukherjee is a businessman. Balachadran, 33, is a blogger who regularly writes for various journals. They all work from home, and have compartmentalised their time between their children and their work carefully, and if one might add, with success. The decision, all three of them maintain, was organic. “When you are away you don’t know what happens at home. 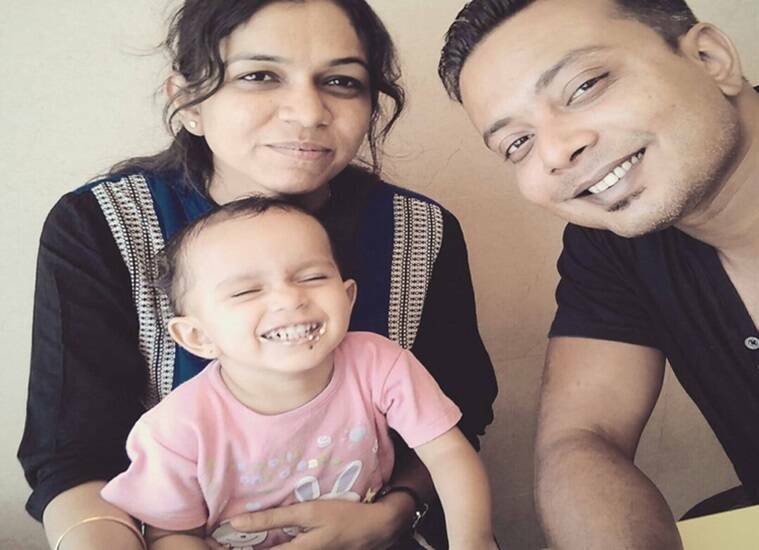 I cannot leave my child with a stranger,” says Mukherjee, who relocated to Gujarat from Kolkata two years back. Married for eight years now, the couple was facing some financial constraints back home and was trying for government jobs. They had mutually decided to shift the moment one gets it. His wife Heena Parmar Mukherjee got through in Gujarat and Mukherjee, keeping his side of the bargain, moved. “I realised one of us has to stay back at home as Shivangi was too young. Since my wife was busy I decided to do it,” Mukherjee says, without a hint of regret in his voice. Swati Prabhakar took a year-long sabbatical after the birth of Mysha and the office she worked then later refused to extend the leave any longer. Prabhakar could feel it getting it to her. “I could see her getting frustrated, so I started staying back intermittently to look after Mysha,” he says. Swati shifted jobs later, and Prabhakar started enjoying his time with his two-year-old daughter. From February this year he started working from home full time, going only occasionally to office to attend meetings. “I was always worried about what exactly Mysha is doing at home,” Prabhakar says, while stealing glances at his daughter, the relief evident in his voice now. Balachandran, on the other hand, insists it was a “natural progression”. “Both my wife and I were at the peak of our careers in London when we started discussing relocating to India. My wife was fortunate to obtain a promotional transfer within her firm itself, and since we were both keen to ensure that at least one of us be with our then one-year old son, I decided to take a break and pursue the role of a stay-at-home dad,” he says. It has been four years since. If asked whether they regret their decision, the answer, unanimously, is a resounding no. All three of them are fathers who are doing what they are doing because, quite simply, they wanted to do it. They wanted to be there for the child and see them growing up. They are not trying to show to the world that they are better at this than their wives. They are, as Balachandran says, “work in progress”. “I run for 8km every day and play golf. Ask any of my male friends to do the same,” Prabahakar says, almost hurling a challenge to the world, albeit in jest, when asked if staying at home hurts his machismo. They have understood that machismo does not, and should not overlap with fatherhood, and perhaps that is why seem so enviously comfortable in their masculinity, to the extent of not feeling the need to corroborate or prove it. There is ingenuity in what they are doing and how they are going about it. Mukherjee learns lullabies from Youtube to sing them out for his daughter, and Mysha has taken up the habit of reading from Prabhakar who is a voracious reader himself, something the doting father is only too proud of. Are they aspiring to be super dads? They do not agree. “I am basically taking care of my son, which I should do anyway. There is no need to be put on a pedestal,” Balachandran says. They insist that all they are trying to be are fathers. In the process, they have merely adopted a different role than the one they are traditionally designated to. The smiles they break into while talking about their child, and the need to not probe but merely listen as they recount how understanding and empathetic their children already are, quickly dispel any doubt one might have regarding their fondness to their new role. They are happy, as happy as they could be.